Commander Shishir Kumar Yadavannavar (from Belagavi) of the Indian Navy was awarded with the Sarvottam Jeevan Raksha Padak posthumously for saving the lives of civilians and naval staff despite staring at the face of death in the Bay of Bengal. The 32-year old commander while posted at Naval Armament Inspection Cell in NSTL, Visakhapatnam, had embarked Indian Navy’s Torpedo Recovery Vessel (TRV-72) from INS Ranvir after User Evaluation trails on November 6, 2014. A few minutes later flooding has reported in the TRV-72 steering gear compartment. 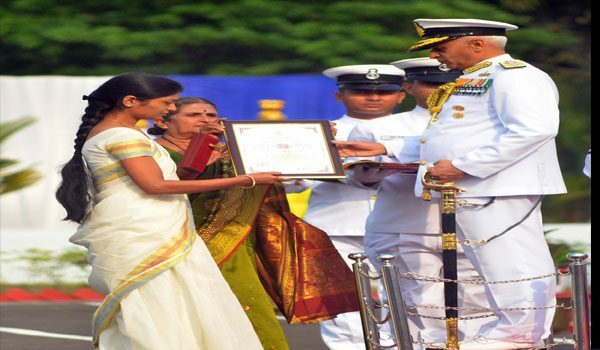 Shishir Kumar’s mother Ningavva and his wife Rohini Kumar received the award from Chief of Naval Staff Admiral Sunil Lanba during the naval investiture ceremony at Command Parade Ground, Eastern Naval Command at Vishakapatnam recently. Shishir a resident of Rani Chenamma Nagar, Belagavu studied in Kendriya Vidyalaya No.2 camp and did his engineering in Gogte Institute of Technology. Shishir Kumar’s wife Rohini Kumar and his son Gopinath and his parents Shivarudra and Ningavva waited for safe return of Shishir Kumar but lost hopes a few days after the incident. For supreme sacrifice and exceptional act of selfless courage, Shishir Kumar was awarded the Sarvottam Jeevan Raksha Padak. The efforts to contain flooding yielded no results and the situation became grave increasing flooding.Shishir Kumar during the most chaotic and panicky situations had maintained unruffled poise and helped in saving the lives of civilians and navy personnel. The young commander from Belagavi region of Karnataka led by an example and chose to voluntarily go below decks after ensuring that all his team members were safe. He thereby stood as an epitome of selfless sacrifice till his last breath. The TRV-72 sank to a depth of about 370 metres, about 35 nautical miles south of Vizag and 28 nautical miles from the closest point of the coast.